Last month Korean Air was the latest airline to inaugurate the massive Airbus A380 jumbo jet into service and became the first to fly the plane with regular service across the Pacific between New York's JFK and Seoul Incheon. 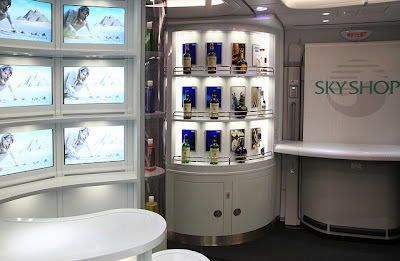 One unique feature of Korean Air's version of the plane that been drawing attention is the onboard duty-free shop. In a first, passengers can browse actual items in a physical shop rather than through brochures that has been the common method for onboard duty-free shopping. 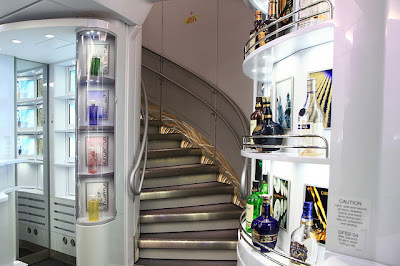 Plans are to outfit the the airline's order of 13 A380 jets with a duty-free shop at the back of the main deck. 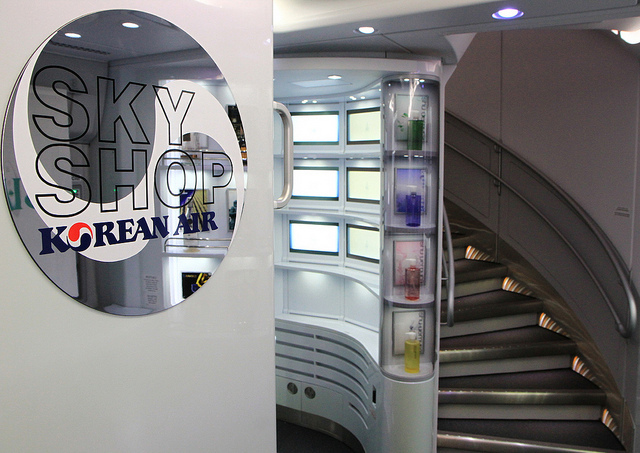 The Sky Shop (as it is named on the jet) takes the place of 13 economy seats, a lavatory and storage closet. The shop will focus on high-end goods such as makeup, perfume, jewelry and watches. Pricey bottles of perfume and liquor are magnetized to ensure they do not fall off the shelves during turbulence. 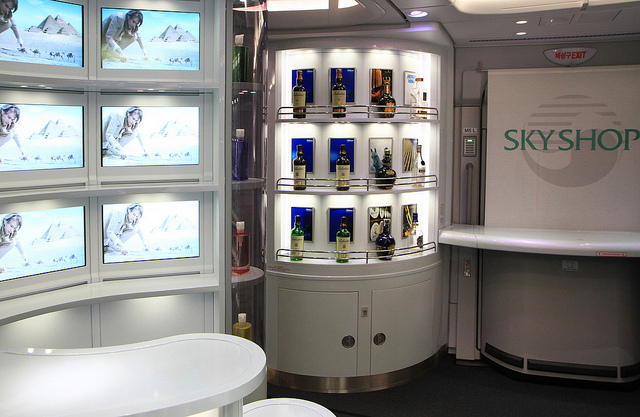 The airline reports that that Korean passengers tend to buy more duty-free products compared with Europeans and South Americans and Korean Air's flights tend to sell out of items. Though the airline loses revenue with the loss of seats, the airline's view is that they will make more money with duty-free sales and selling advertising space in the shop. Each shop is designed with five display units, each of which can hold up to 66 pounds of merchandise, and has the room to display 64 different individual items. After take-off, the shop crew will take products out of storage and set up the store. First class passengers will have priority visit to the duty-free shop followed by business class and then passengers flying in economy. Orders are placed at the shop with a crew member, one of whom will later deliver the goods to the passenger's seat. Click HERE to learn more about the Korean Air A380 which the airline advertises as "Where Dreams Are Made." The video below is about the design of the duty-free shop.